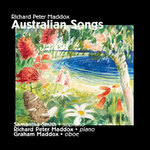 Australian songs / Richard Peter Maddox. Contents note: 1. Lovely day -- 2. Figs -- 3. Letters -- 4. News flashes -- 5. Rain. 22 Feb 95: Madgwick Hall, University of New England, Armidale, NSW. Featuring Mary Hewes Buck.